This is the time of stories about refugees and immigrants in every format possible. Duncan Tonatiuh is a children's book writer, well-known for his award-winning picture book Separate is Never Equal: Sylvia Mendez and her Family's Fight for Desegregation. In Undocumented, a Worker's Fight Tonatiuh adds his voice to the subject in his first adult graphic novel. The graphic format makes complicated social issues simple and clear, but unfortunately doesn't do much more than that. The main character, Juan isn't particularly distinctive. His journey from low-wage illegal to advocate for fair labor practices happens easily. The barriers he faces are predictable and quickly overcome. Without dramatic tension, a distinctive voice, or a compelling character, the story relies on the basic theme of fighting against injustice to engage the reader. A book needs more than the moral highground. It needs more than a topical message. It needs to deliver that message with incisive power or provide a point of view that's fresh. Sadly, Undocumented does neither. The art is appealing, however, and lifts the pedestrian narrative to a higher level. The design brings it back down with the use of the accordian-fold rather than page turns, which doesn't add to the visual narrative and feels gimmicky instead. Calling it a “reinterpretation of ancient Mixtec codices” seems quite a reach. What's the point of the “reinterpretation”? To evoke Juan's culture, what he left behind? If that is the intention, the result falls short, looking instead like a misguided attempt to add depth to a slender story. 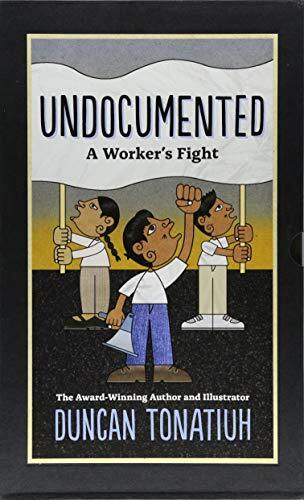 If readers are looking for a quick summary of the challenges undocumented workers face in the United States, this graphic novel provides a quick, easily digested recap. For more compelling stories, try Thi Bui's The Best We Could Do or Bessora's Alpha: Abidjan to Paris.